Looking for exclusive insights that will help you determine the right cloud strategies for your business? Watch the free Make Your Cloud Strategy Your Competitive Advantage webinar today! Data has become the new currency of global business. With so much data being generated and so many ways data can be useful to the enterprise – it has become imperative that organizations deploy robust infrastructure and processes to safeguard their data, back it up and recover it when needed. Stakeholders need to assess the use of their data, manage different types of data and choose among cloud options while simultaneously balancing business and cost benefits. The most important first step is to decide on the type of cloud deployment desired. With public clouds, private clouds and hybrid clouds all being options, cost, control, and ease of implementation can guide the decision. Going to the Cloud – Practical Strategies to Match your Business Needs white paper covers this topic in greater detail. After deciding on the decision to go to the cloud, there are a whole set of considerations involved in determining the right partner for implementing the cloud model. A holistic approach that considers not just the feature sets of cloud providers but also the ease and risk mitigation involved in migrating to the cloud is prudent. Multiple business drivers shape the trade-offs when organizations deploy a cloud infrastructure. Fast time to market, greater flexibility, lack of internal competence etc. are often top of mind for stakeholders. These business drivers need to be balanced with the characteristics that cloud infrastructure partners bring during evaluation. Architecture and service offering – A scalable and sustainable cloud architecture enables organizations to adapt to changing industry and competitive dynamics. The decision to move to a cloud provider can be expensive to turn back and choosing a partner who offers flexibility, scale, and adequate growth options can save costs. Support for business workflows and future workflows is important to avoid surprises. Multiple types of storage offerings to fit different data needs is also an important aspect. Security – Securing data should be the cornerstone of any cloud strategy. Ensuring that the provider is trusted and has robust security measures in place is crucial. In addition, understanding how the provider keeps the measures updated to thwart new and emerging threats is essential. Compliance – Depending on the industry and applications many compliance measures might apply to the data. Ensuring that the provider is aware and can comply with regulatory (ex: DPR, SOC 2, PCI DSS, HIPAA etc.) or other compliance frameworks can help mitigate risks related to inadvertent data leaks and hacks. Manageability – A key element of a good cloud management is the tool-set available to managers to keep tabs on the deployment, usage and resource consumption. When an array of dashboards and toolsets are available, managers can easily visualize information, derive insights and make objective decisions dynamically. Service Levels – A cloud provider’s commitment to published SLAs that align with requirements is a crucial consideration when choosing providers. Detailed SLA thresholds by service offered and costs associated with each tier of service is an important first step to match organizational needs with partner offerings. Also, historical performance to expressed SLAs is useful in assessing a partner’s commitment to SLAs. Support – By far the biggest factor when choosing cloud partners should be the support available not just from the partner but from partner’s network of service providers. Migration consulting, migration strategy development, cloud design, and architecture etc. are just a few areas that need external support to complement often less specialized internal resources. Partners who not only bring solid infrastructure solutions but also support the infrastructure with services help can dramatically cut down adoption costs and help build sustainable planning and management frameworks. Pricing Structure – Transparent pricing policies that enable straightforward budgeting and strategic planning for growth are hallmarks of a good cloud provider. Infrastructure options that allow for flexibility of customer business models are desired. Pay as you go choices and dedicated instances are also necessary. While different partners excel along specific dimensions, exercising the right tradeoffs to match the most cost-effective cloud solution is best. Not considering the trade-offs and implications can create inordinate costs and inflexibility post-implementation. Similarly, not matching the needs of the organization with the capabilities of the cloud provider can doom the success of a cloud adoption project and contribute to unnecessary IT expense and productivity loss. Watch the Make Your Cloud Strategy Your Competitive Advantage webinar for insights and frameworks that will help you determine the right cloud strategies for your business. 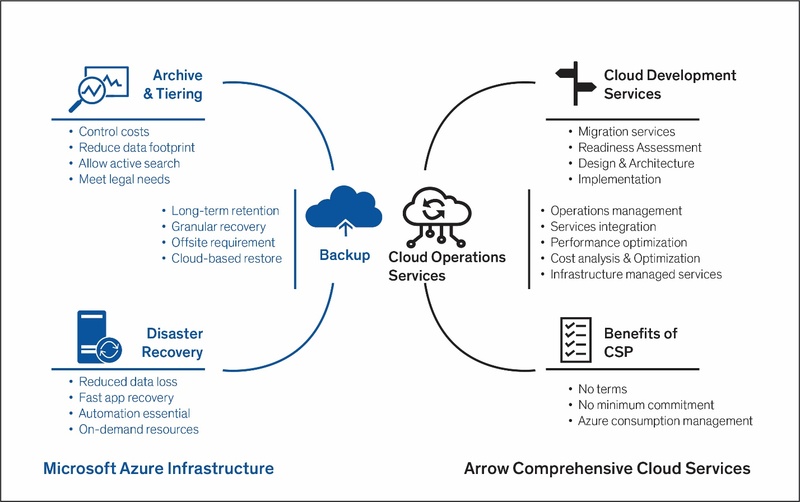 Arrow and Microsoft form a powerful combination of solutions to create a unique value proposition for stakeholders seeking cloud storage and backup infrastructure. Together they offer customers a comprehensive solution set that can match any needs from the enterprise to the IoT edge. Low-cost, massively-scalable, tiered backup storage solution in the cloud which reduces forecasting risks while transforming capital expenditures to a pay-as-you-go cloud model and yet have the flexibility to scale. 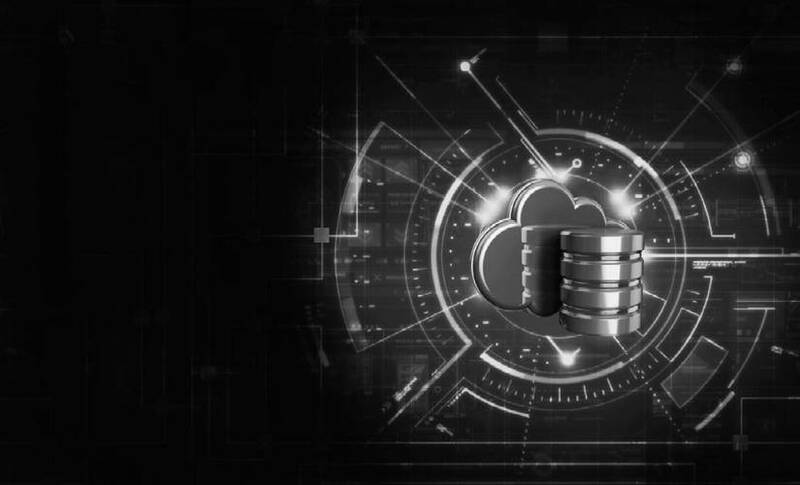 Hassle-free backup and data archiving that improves productivity by simplifying backup and data archiving with backup-as-a-service and hybrid storage solutions that easily restore data and applications from the cloud. Policies designed to meet a variety of compliance requirements with 99 years of retention for backup data and pick any Azure region around the globe as a backup and archive location. Tier 1 support and escalation support that goes beyond the cloud and incorporate hardware, operating systems, integration services, and cloud storage services. Comprehensive portfolio of components and business services: that include silicon, sensors, and IoT solutions, custom built hardware solutions and software. From secure and compliant asset disposals and buybacks to custom finance solutions, Arrow offers a slew of business services throughout the product lifecycle. When assessed along key dimensions the feature sets that Microsoft and Arrow offer are unmatched in the industry. 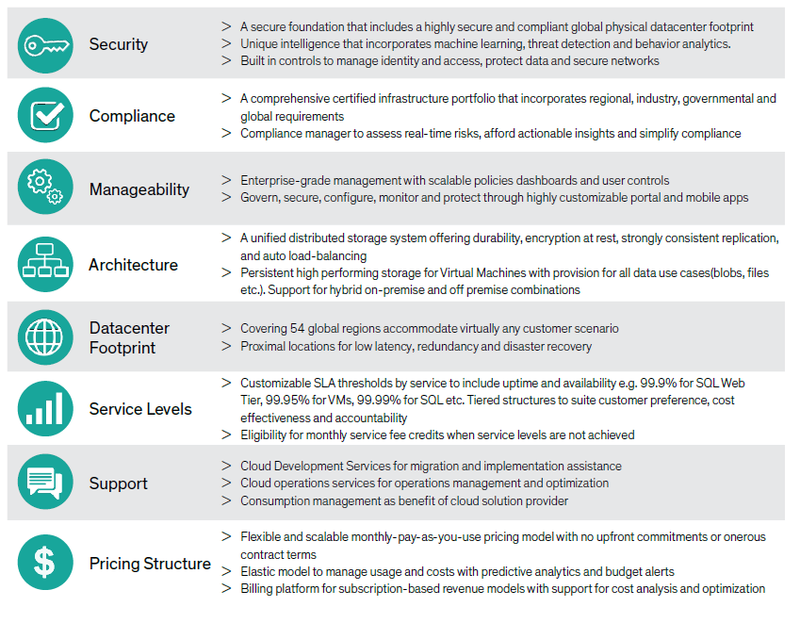 The figure below offers a summary of all the benefits customers obtain when partnering with Arrow and Microsoft. The breadth and details involved in adopting cloud-based infrastructure can be overwhelming but Arrow together with Microsoft has focused on making the journey to the cloud seamless, cost-effective and low risk. The capabilities particularly target OEM and ISV customers embarking on new business models that make cloud infrastructure a key element of next-generation IoT products and services. A variety of concept validation programs are available to customers to test the waters for cloud infrastructure. Engaging Arrow representatives to design engagements that suit business requirements can be a low-risk first step that leads to more in-depth assessments and migrations. Contact Arrow Intelligent Systems at msembedded@arrow.com for cloud storage assessment services. The assessment methodology follows the “cloud migration decision framework” to identify application complexity, priority, potential benefits by assessing the various parameters including architecture, performance, financial attributes, operations, and security & compliance. This also helps to derive the migration strategy, approach aligning with the business migration drivers. For further insights and frameworks to help you determine the right cloud storage strategy for your business, attend the “Make Your Cloud Strategy Your Competitive Advantage” webinar, hosted by experts at Arrow, Microsoft and ReadWrite Labs. 22+ years experience in Embedded Hardware & Solutions, with 13 years at Arrow spanning multiple roles. Scott has a BSME degree from San Diego State University. He is based in Houston, Texas.